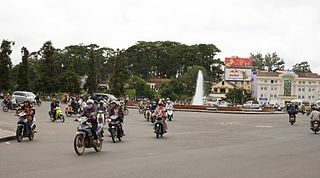 Da Lat or Dalat is located in south central high ground which has a small nick called paris van vietnam. In the past the French build their villas in the highlands to avoid the heat of Saigon. Overview Dalat looks like a perfect combination between France and Vietnam. Many houses and hotels built with French or European architectural style. The city stretches across the hills of pine with a lake in the middle. The temperature was quite cool, and at night can reach 10 degrees Celsius. It should be understood that Dalat is the most visited tourist city of rich people from Ho Chi Minh City. Luxury hotels with golf field, small hotels, shops, cafes, all in the city. Dalat is a favorite location for family holidays, office events, and also honeymoon. For foreign tourists, dalat may only be used as a haven from the hustle Saigon moment. However, if you are interested to go to this town, sitting in a cafe is not the main activity that you are doing the data. You can spend time for hill climbing, cycling, or walking around the plantation and coffee in this area. The most common way used to go to Dalat is by bus from Ho Chi Minh City. Phuong Linh Tran and Main Express operates several buses to DalaT from Nha Trang or Ho Chi Minh City. From Nha Trang, a travel time around 4 hours with a stop at a cham temple. From Saigon, the trip took about 7 hours when traffic is congested. If you want to save time, Air Mekong and Vietnam Airlines operate flights from Hanoi, Da Nang, and Ho Chi Minh City. In dalat, depending on where you are staying, walking is probably the best way to roam the city. You can also ride the Xe Om which is can be found anywhere. Taxis are easy to find, but you have to be vigilant with their metered. Want to save even more? City buses can be as choices. There is a bus that passes almost all the interesting attractions in this city. you can wait for the bus at a stop near the lake, near the market, and on the road Khu Hoa Binh. Renting bicycles and motorcycles can also be done.